Indian roasted cauliflower is one of my favorite dishes to make. Aloo Gobi (translation: Potato Cauliflower) is probably the most popular Indian cauliflower dish that’s on restaurant menus. I do like it in the curry/gravy form, but this dry dish that’s roasted has so much flavor that it’s my go-to cauliflower recipe when I’m cooking Indian food. 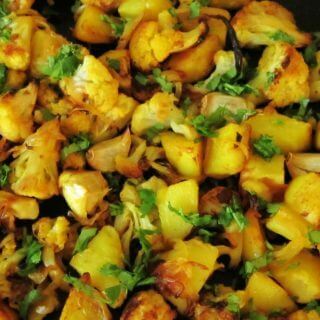 I came up with the recipe myself because I love roasted vegetables of any kind and of course, I love Indian spices. So, this is the way I roast most veggies: I place a stone baking dish in the oven and preheat the oven to 425 degrees F. Once the oven has reached its temperature, I remove the baking pan, drizzle with oil and add the vegetables already mixed with spices. Then I bake it until the vegetables are cooked and slightly blackened in spots. There’s something about roasting vegetables that brings out amazing flavors – I think it’s the caramelization, which brings out the sweetness. If your kids don’t like some vegetables, try serving them roasted – you just might get them to eat it. 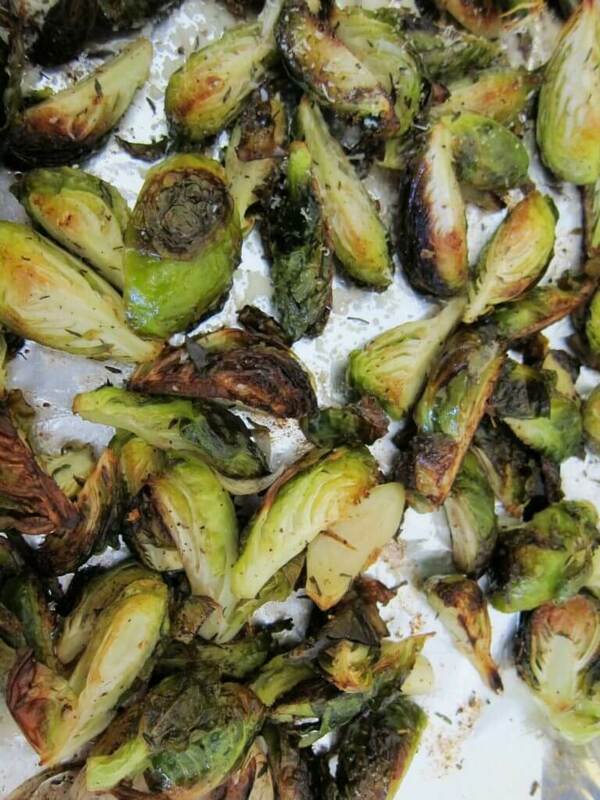 Even brussels sprouts taste good! If you’ve never tried vegetables this way, what are you waiting for? The garlic is roasted whole, unpeeled. It tastes delicious when you squeeze out the garlic from the skin once it’s cooked. It’s also perfectly fine to have a few charred bits of vegetables, they add to the taste. Keep an eye on the dish, though. Every oven is different, so make sure not to burn it. Oh, and one more secret, I’ll sometimes sprinkle parmesan cheese over the top, right when it comes out of the oven. Not very Indian, but don’t knock it till you try it! 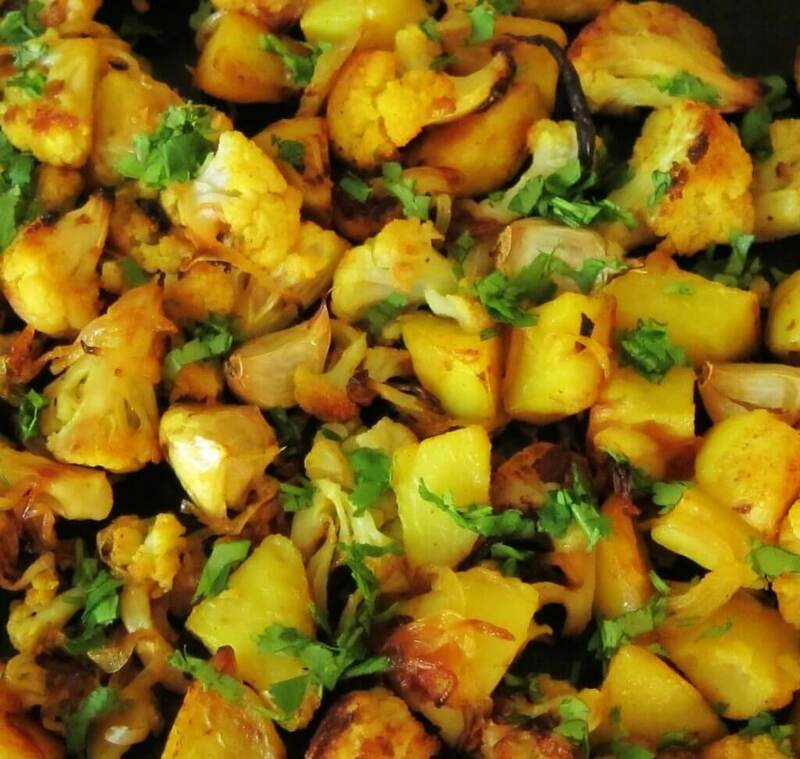 Indian Roasted Cauliflower takes roasted cauliflower to another level. This easy-to-prepare dish is delicious with its sweet, sour, salty, spicy flavors. Line a large heavy baking sheet or baking dish with aluminum foil. Place baking sheet in oven and preheat to 425 degrees F.
Add cubed potatoes to a saucepan with enough water to cover the potaotes. Stir in 1/4 tsp turmeric and bring to a boil. Simmer for 7 minutes or until partially cooked (potatoes should be parboiled: barely tender when pierced with a skewer). In a small bowl, mix brown sugar, 1/4 tsp turmeric, cayenne, garam masala, salt with lemon juice and oil. 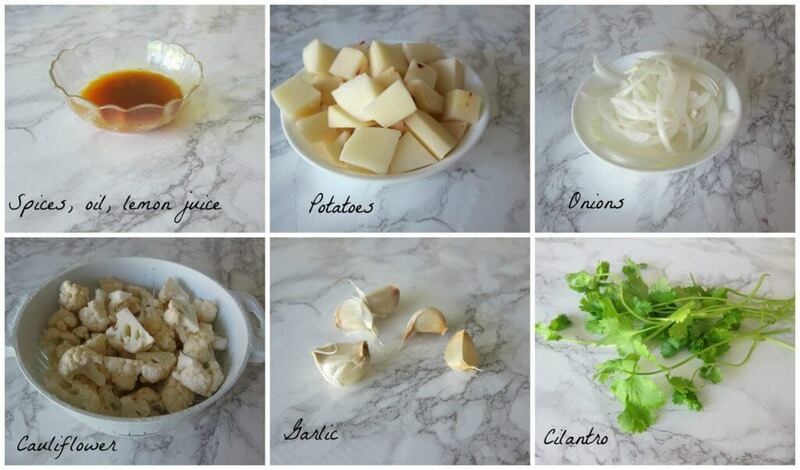 Place potatoes, onions, cauliflower and garlic into a large bowl, and pour oil mixture over the top and stir to coat. Once the oven has reached the desired temperature, remove the baking sheet and drizzle with vegetable oil. Transfer contents of bowl to the baking pan. Place baking pan on the center rack of the oven. Bake for 30 to 40 minutes or until vegetables are cooked through and lightly charred, stirring the cauliflower mixture halfway through. 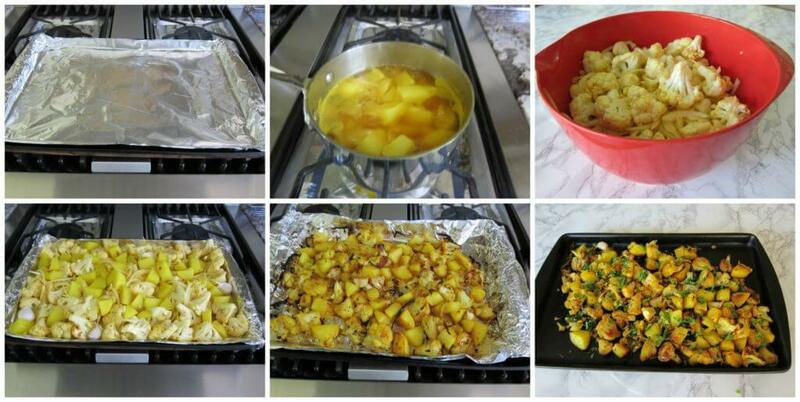 I use a stoneware baking sheet to roast the cauliflower. When you transfer the contents of the bowl to the baking sheet, watch out for splatters because the vegetables are wet and the baking sheet is hot, hot, hot. I’m always wondering what to make as a side dish for Tikka Masala (besides the copious amounts of naan we consume). This will be perfect! Yes, that would make a great side dish. I usually make it with my chicken curry recipe. I love all the different flavours that you used. Roasted vegetables are amazing and you took it to the next level with your spices. I’m excited to try this! Let me know how it goes Marie. This looks delicious Neena! Potatoes and cauliflower have a nice textural contrast to one another, so they complement each other perfectly. Great recipe! It’s very tasty – do try it out Alyssa. Love this recipe! Cauliflower is one of my favorite veggies, although I’ve never met a veggie I don’t like, and I can’t wait to try out this flavor combo! Pinning for later! As a kid, I hated cauliflower but now it’s one of my favorites too! Hope you get to try it out Erica.